پارسایی, احمد, شکریه, محمود مهرداد, مندعلی, مهدی. (1396). مدلی جدید برای همگن‌سازی مواد مرکب چندفازی با درصد حجمی بالای اشغال‌کننده. 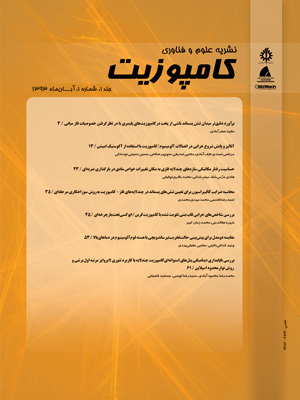 علوم و فناوری کامپوزیت, 4(2), 195-204. احمد پارسایی; محمود مهرداد شکریه; مهدی مندعلی. "مدلی جدید برای همگن‌سازی مواد مرکب چندفازی با درصد حجمی بالای اشغال‌کننده". علوم و فناوری کامپوزیت, 4, 2, 1396, 195-204. پارسایی, احمد, شکریه, محمود مهرداد, مندعلی, مهدی. (1396). 'مدلی جدید برای همگن‌سازی مواد مرکب چندفازی با درصد حجمی بالای اشغال‌کننده', علوم و فناوری کامپوزیت, 4(2), pp. 195-204. پارسایی, احمد, شکریه, محمود مهرداد, مندعلی, مهدی. مدلی جدید برای همگن‌سازی مواد مرکب چندفازی با درصد حجمی بالای اشغال‌کننده. علوم و فناوری کامپوزیت, 1396; 4(2): 195-204. هدف این تحقیق بدست آوردن خواص مکانیکی مواد مرکب چند فازی با درصد حجمی بالای اشغال‌کننده می‌باشد. بدین منظور یک روش جدید برای همگن‌سازی کامپوزیت‌های چند‌فازی ارایه گردیده است. روش همگن‌سازی ارائه شده در این مقاله بر پایه ترکیبی از مدل موری-تاناکا و مدل دیفرانسیلی توسعه یافته است. روش همگن‌سازی جدید با نام مدل MT-DS نام‌گذاری گردیده و شامل چهار مرحله می‌باشد. در مرحله اول، کرنش متوسط ایجاد شده در اشغال‌کننده محاسبه می‌شود. در مرحله دوم، تانسور سفتی برای ماده همگن‌سازی شده بر پایه مدل دیفرانسیلی تصحیح شده محاسبه می‌گردد. سپس در مرحله سوم، تانسور تمرکز کرنش بر اساس مدل موری-تاناکا و معادلات اشلبی محاسبه می‌گردد. در انتها و در مرحله چهارم، تانسور تمرکز‌ کرنش و تانسور سفتی برای ماده همگن‌سازی شده بر اساس مدل MT-DS محاسبه می‌شوند. برای همگن‌سازی، با توجه به شکل اشغال‌کننده و درصد حجمی آن، تانسور تمرکز ‌کرنش در هر مرحله محاسبه شده و برای محاسبه تانسور سفتی ماده همگن‌سازی بکار گرفته می‌شود. با این روش در هر مرحله خواص ماده زمینه همگن‌شده به جای مشخصات ماده زمینه اولیه وارد محاسبات می‌‌شوند. با انجام این عمل تأثیر سایر اشغال‌کننده‌ها بر روی اشغال‌کننده‌های مجاور نیز در نظر گرفته می‌‌شود. این جایگزینی به صورت پیوسته تکرار می‌‌شود تا در انتها تانسور سفتی معادل بدست آید. برای اعتبارسنجی مدل ارایه شده جدید، نتایج بدست امده از آن با نتایج آزمایش‌ها مورد ارزیابی قرار گرفتند. نتایج بدست آمده از ارزیابی مدل جدید حاکی از توانمندی آن می‌باشد. This study aims to obtain mechanical properties of multi-phase composite materials with high volume fraction of inclusion. For this purpose, a new method is presented for the homogenization of multi-phase composites. A new homogenization method was developed based on a combination of the Mori-Tanaka model and the differential model. The new homogenization method was named MT-DS model which consists of four stages. In the first stage, average strain created in the inclusion is calculated. Then, based on the modified differential scheme, the stiffness tensor for the homogenized material is calculated. In the third stage, based on the Mori-Tanaka model as well as Eshelby equations, the strain concentration tensor is calculated. Finally, in the fourth stage, using the MT-DS model, the strain concentration and stiffness tensors for the homogenized material are calculated. For homogenization, according to shape of the inclusion as well as its volume fraction, the strain concentration tensor is calculated and the homogenized material is used in order to calculate the stiffness tensor. Using this method, in each stage, instead of properties of the raw matrix material, properties of the homogenized matrix material are included in the calculations. The effect of other inclusions on the adjacent inclusions is also considered. This procedure is continuously repeated until the equivalent stiffness tensor is obtained. To validate the new proposed model, obtained results were evaluated in a comparison with the results of the experiments. Dvorak, G. J., “Transformation Field Analysis of Inelastic Composite Materials,” Springer, Vol. 377, No.1, pp. 1-16, 1997. Wu-Gui, J. and Ren-Zhi, Z., “Homogenized Finite Element Analysis on Effective Elastoplastic Mechanical Behaviors of Composite with Imperfect Interfaces,” International Journal of Molecular Sciences, Vol. 15, No.1, pp. 389-407, 2014. Jansson, S., “Homogenized Nonlinear Constitutive Properties and local Stress Concentrations for Composites with Periodic Internal Structures,” International Journal of Solids and Structures, Vol. 29,No.1, pp. 2181-2200, 1992. Lielens, G., “Micro-macro Modeling of Structured Materials,” Ph.D. dissertation, UCL/FSA, Louvain-la-Neuve, Belgium, 1999. Pierard, O., and Friebel, I., “Mean-field Homogenization of Multi-Phase Thermo-Elastic Composites,” Composites Science and Technology, Vol. 64, pp. 1587-1603, 2004. Qu, J. and Cherkaoui, M., “Fundamentals of Micromechanics of Solids,” John Wiley & Sons, pp. 60-70, 2006. Hill, R., “A Self-Consistent Mechanics of Composite Materials,” Journal of the Mechanics and Physics of Solids, Vol. 13, No.3, pp. 213-222, 1965. Nemat-Nasser, S. and Hori, M., “Micromechanics Overall Properties of Heterogeneous Materials,” Elsevier Science Publishers, Vol. 10, No.1, pp. 812-822, 1999. Ouaar, A., Doghri, I. and Thimus, J. Fr., “Modeling and Simulation of Fiber Reinforced Concrete using Homogenization Schemes,” 5th National Congress on Theoretical and Applied Mechanics, pp. 355-358, 2000. McLaughlin, R., “A Study of the Differential Scheme for Composite Materials”, International Journal of Engineering Science, Vol. 15, No.1, pp. 237-244, 1977. Advani, S. and Tucker, C. L., “The use of Tensors to Describe and Predict Fiber Orientation in Short Fiber Composites,” Journal of Rheology, Vol. 31, No.1, pp. 751-784, 1987. Friebel, C. Doghri, I. and Legat, V., “General Mean-Field Homogenization Schemes for Viscoelastic Composites Containing Multiple phase of Coated Inclusions,” International Journal of Solids and Structures, Vol. 43, No.1, pp. 2513–2541, 2006. Ouaar, A., “Micromechanics of Rate-Independent Multi-Phase Composites. Application to Steel Fiber-Reinforced Concrete,” Ph.D. thesis, Université Catholique de Louvain Faculté des Sciences Appliquées, 2006. Gross, D. and Seelig T., “Fracture Mechanics with an Introduction to Micromechanics,” Springer, 2006. Ouaar, A. Doghri, I. Delannay, L. and Thimus, J. F., “Micromechanics of the Deformation and Damage of Steel Fiber-Reinforced Concrete,” International Journal of Damage Mechanics, Vol.16, No.1, pp. 227-260, 2007. Doghri, I. and Tinel, L., “Micromechanical Modeling and Computation of Elastoplastic Materials Reinforced with Distributed Orientation Fibers,” International Journal of Plasticity, Vol. 21, No.1, pp. 1919-1940, 2005. Hill, M. R., “Determination of Residual Stress Based on the Estimation of Eigen Strain,” Ph.D. Thesis, Stanford University, 1996. Kouznetsova, V., Brekelmans, W. A. M. and Baaijens, F.P.T., “An Approach to Micro-Macro Modelling of Heterogeneous Materials,” Computational Mechanics, Vol. 27, No.1, pp. 37-48, 2001. Hashin, Z. Shtrikman, S., “Variational Approach to the Theory of the Elastic Behaviour of Multiphase Materials,” Journal of the Mechanics and Physics of Solids, Vol. 11, pp. 127-140, 1963. Compressive Strength of Molded Concrete Cylinders, ASTM C 39-49, 2002. Flexural Strength of Concrete using Simple Beam with Center Point Loading, ASTM C 293-54T, 2002. Strain gages for transducer, Zhonghang Electronic Measuring Instruments Co. Ltd., 2015.